In the June issue of the periodical "Test-Aankoop/Test-Achats", 13 double shell compact fluorescent lamps with a brightness between 500 and 700 lumen and with an E-27 fitting were investigated. • A certain model should, according to the packaging, have a lifetime of 8000 hours (= 8 years). Four of the five test samples were already broken down before they burned 5000 hours. The only still burning lamp reached at that moment only 70% of its brightness. • A sample of another model failed already after burning 1800 hours.
" The samples which reached 5000 hours, had lost at that moment more 35% to even 80% of their brightness. Moreover, this lamp could hardly be switched on and off 5000 times." This lamp can actually no longer be named a 'low-energy light bulb'. "CFLs are not always environmentally friendly"
In the June issue of the periodical "Test-Aankoop/Test-Achats", 13 [double shell] CFLs were investigated. • No lamp reached half the full intensity of light within 30 seconds. "These teething troubles can no longer be justified ", said spokesman Ivo Mechels. • The lifetime of the lamps does not appear to correspond to the promised lifetime on the packaging. "Six of the thirteen species scored very poorly", said Mechels. • The collection of broken bulbs is not always as it should. "They usually end up in an ordinary plastic bin. In places lay broken lamps. That mercury is released in this way, is hardly realized." Another Belgian newspaper "De Standaard", May 25, 2012, writes: "The CFL is almost dead"
" CFLs are less efficient and ecological than their manufacturers try to make you believe. And they seem to have lost faith in them themselves." "CFLs are more sparing and last longer than conventional incandescent bulbs. But they still have teething problems that (no longer) should be allowed. This is no new technology anymore, so manufacturers can no longer hide (behind that idea)." The Belgian consumer organisation Test-Aankoop/Test-Achats published their report on CFLi [Google translated version] on May 24th. This organisation buy products from retail sources and have undertaken long term tests with rather disappointing but not unexpected results. This is exactly what individual governments in the EU are supposed to be doing to ensure that the products on the market meet the requirements of the Eco Design legislation however seem to be failing at. it has more information going back in time - as with the EU (Swedish) scandal of unrecycled dumped fluorescent light bulbs end 2011, also covered in a report on the Ceolas.net website. RGB types are effectively combinations of pure red green and blue sources, without the smooth light output spectrum of incandescents. Meanwhile the now popular and generally simpler/cheaper "white LEDs" have additional issues from effectively mimicking the light quality of fluorescents, that is, from bluey (relatively bright) type LED source light hitting phosphorescent wall coating. More on LED issues here. And that is of course without going into the not always warranted "great upfront expense for long term savings", for many less often used bulbs. About "The lifetime of the lamps does not appear to correspond to the promised lifetime on the packaging..."
Are their Eu neighbour people in Brussels reading this?!! So they are dim short lived and bad for the environment Any surprise they are hard to sell so a ban on the others is necessary to sell them? 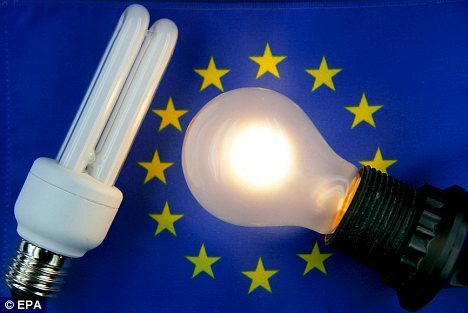 USA Light Bulb Law "Wattages not Legalized"
Fact: Americans Brighter than Europeans! "Many Lights make Handy Work"